Tag line: "The saga of America's dirty faced kids... And the breaks that life won't give them!" In my write up of Yankee Doodle Dandy, I mentioned how my father once videotaped a trio of James Cagney movies, which played late one evening on a local Philadelphia UHF station. Well, a Phillies baseball game that was broadcast right before them went longer than anticipated, and while it wasn’t an issue for either White Heat or The Fighting 69th, which recorded in their entirety, Michael Curtiz’s 1938 crime drama Angels With Dirty Faces was incomplete; I sat through the entire movie one day only to learn that the tape (which had been on a timer) stopped recording before the film was over! In total, 10 minutes were lopped off of the ending, and those who have seen the film know how deeply dramatic its finale is. For months afterwards, I thumbed through the TV Guide looking for this movie, hoping it would replay at some point. 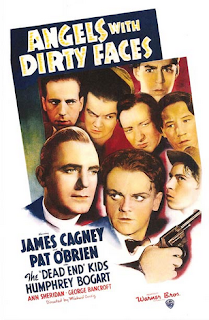 It wasn’t until years later that I finally caught the film's ending, yet even without its climatic moments, I knew that Angels With Dirty Faces was a bona-fide classic. Two teenagers, Rocky Sullivan (Frankie Burke) and Jerry Connolly (William Tracy), get into some hot water one day at a railway yard, and are chased by the police. Jerry manages to slip away, but Rocky is caught and soon after sentenced to reform school. Fifteen years later, Rocky (now played by Cagney), who has drifted in and out of jail most his life, is one of the city’s most notorious gangsters, while Jerry (Pat O’Brien) straightened himself out and became a Catholic priest. Yet try as he might, Father Connolly is unable to control the city’s most troubled young men, some of whom (Billy Halop, Bobby Jordan, Leo Gorcey, Gabriel Dell, Huntz Hall and Bernard Punsly, aka The “Dead End Kids) idolize Rocky and his criminal ways. Rocky does what he can to help Father Connolly out, but at the same time is trying to recover the $100,000 that his shifty attorney, James Frazier (Humphrey Bogart), swindled from him years earlier. With the help of Laury Martin (Ann Sheridan), who Rocky has grown quite fond of, Father Connolly tries to steer his old pal towards the straight and narrow, all the while hoping the young men in Rocky’s “gang” will learn for themselves that crime doesn’t always pay. Angels With Dirty Faces is a perfect storm of Hollywood creativity, starting with its director, Michael Curtiz, who by that point had already helmed Doctor X, Captain Blood, and The Adventures of Robin Hood. In the opening scene of this film, Curtiz skillfully moves his camera through a 1920s-era New York neighborhood, capturing the hustle and bustle of a city street brimming with activity (he’ll repeat this same shot a while later, when the action jumps 15 years into the future, showing the passage of time while also revealing not much has changed on this particular block). Story-wise, Angels With Dirty Faces glides along at a brisk pace, introducing several new characters (like Mac Keefer, Frazier’s business associate played by George Bancroft) who do their part to keep things moving. The film features a number of fine young actors, starting with The Dead End Kids (in later years they would become the Bowery Boys), who, as we eventually discover, are much better at picking a man’s pocket than they are at playing basketball. In addition, William Tracy does a good job as a teenage Father Connolly, but it’s Frankie Burke, doing a spot-on impression of James Cagney, who steals the early moments of the film; watching him, you would swear he was somehow related to the legendary actor. Still, as strong as Burke is, there’s nothing like the real thing, and Cagney delivers yet another stellar performance as a criminal you can’t help but like (his scenes with the Dead End Kids are funny and, at times, even touching). The supporting players, including Pat O’Brien, Humphrey Bogart, and Ann Sheridan, are no slouches themselves, but it is Cagney’s charismatic turn that gives the film its energy. When it comes to James Cagney’s filmography, Angels With Dirty Faces isn’t discussed nearly as often as The Public Enemy, The Roaring Twenties, Yankee Doodle Dandy or White Heat, but it should be. With so much going for it, Angels With Dirty Faces is not only an excellent motion picture; it’s one of its star’s all-time best. A fantastic film, this is. I do think it's a notch below those others you mentioned, but it is still excellent. Well, except that basketball scene. That was painful to watch. It is a great movie. And Rocky's final scene is amazing.